Spectral Cafe — More Books I Have Read! Post-apocalyptic fantasy novels! They are endlessly varied for such a single-mindedly destructive idea. 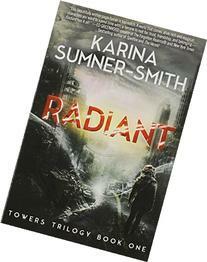 Radiant is the first book in Canadian author Sumner-Smith’s Towers trilogy, and the world is an imaginative one. Set in either a far future Earth or another world entirely, the civilization of her novel survived the long-ago mysterious apocalypse as two communities. In this world, the currency is light energy magically generated by people themselves. Those with lots of magical light live in towers floating above in the air called the City, powered by their inhabitants’ energy, rising and sinking in orbit or joining together depending on their success, with lots of resources and machines. Those without a lot of light energy and wealth, or who choose to hide from the City, live on the ground below the City in the ruins of skyscrapers and buildings past called the Lower City, scrapping out a living with little ability to grow crops in the blighted soil. At night, the inhabitants of the Lower City hide in buildings from roaming zombie-like attackers who come out after dark. Xhea is an unallied orphan in the Lower City with no light magic at all, only a strange dark energy inside her that causes her to see in black and white. That darkness lets Xhea go down into the ruined subway tunnels and underground places that those with light magic cannot stand to enter, and retrieve old world artifacts to sell for food. It also allows her to see ghosts — the core remnants of dead people that sometimes haunt their loved ones, attached by a tether to their victims, which Xhea can help detach in return for temporary bits of light magic. A rich man from the City above comes down and pays Xhea to take on the tether of the ghost of a young woman. But the ghost, Shea, is a Radiant — a person who generates huge amounts of light energy, and her home Tower desperately wants her ghost back to put into a body. Trying to help Shea and keep herself alive causes Xhea to start learning some new things about her own form of magic and truths about the society that is in a state of flux. If that sounds complicated, Sumner-Smith actually lays it out very clearly and with lots of high action sequences and good description. 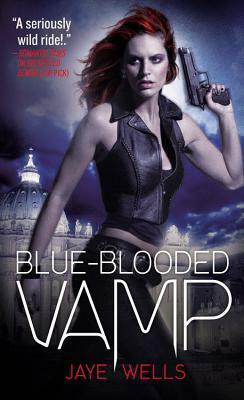 She mixes mystery, science fiction elements, horror, politics and action fantasy together into a nice blend. Xhea is an appealing heroine, traumatized but stubborn, and Shea is definitely an interesting twist on the concept of the princess fallen from the high tower. Some of the other characters are maybe a little bit under-cooked, but there’s clearly set-up for lots of exploration in the next two books, and the society itself is really fascinating. So I’m definitely going to read through this trilogy. 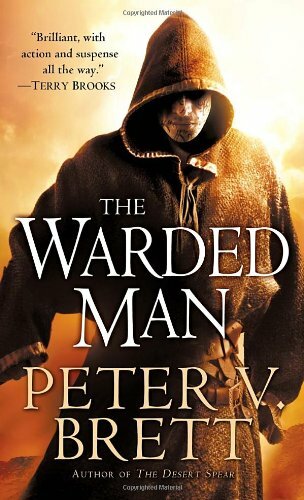 This is the first book in British author Peter Brett’s bestselling Demon Cycle series that started in 2008. Some folks see him as part of the grimdark lit movement while others don’t. Having read the first book, I’d say that he isn’t quite in grimdark territory and is closer to something like Kate Elliott’s Crown of Stars series. The world of the Demon Cycle is pretty grim, however. It’s been through the apocalypse, twice, in history and now human beings struggle to survive and hold on to what civilizations they’ve got because the apocalypse occurs every night when the sun sets. At that point, strange monsters with magical powers emerge from the ground/core of the planet (and another dimension,) and attack any living creature they can get ahold of, especially humans, until disappearing in the morning. The novel focuses on three main characters — Arlen, a driven young man who trains as a messenger and seeks to find the long lost combat wards that will allow humans to better fight the corelings rather than just defend against them; Leesha, a young woman who flees scandal and an abusive family by becoming a healer and learns that herbs have more uses than she thought; and Rojer, an orphan who is adopted by a bard-like entertainer and takes up that trade, and learns that his fiddling might have an unexpected effect on the corelings. 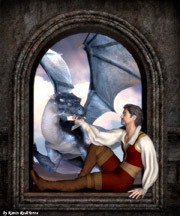 Arlen is the protagonist and a fairly strong character who travels the most, exposing us to different communities. The novel might have been a little stronger if it had just been about him. Rojer is a wonderful character, though, and Leesha has a number of interesting aspects. However, she is the weakest of the three because Brett has some material that is just not really believable for female readers, in my opinion. His women characters overall tend to be a bit one-dimensional in a society very oppressive to women — because they need them to produce a lot of new babies — and Leesha’s village folk aren’t maybe as fascinating for me as Brett would like to make them. But the writing overall is good and the world and its demons is fairly interesting, with some very emotional scenes. Further books in the series seem to branch out into that world, so I may be reading more in the series. I’m curious to see what else they learn about fighting the corelings and why and how they exist. Do I consider that justified? Oh yes. It’s a lush, brutal, psychological adventure of a novel that uses different timelines that follow different types of stories, all connected. The world in it consists of one known massive continent that stretches from pole to pole. The land mass is full of volcanic and seismic activity that regularly causes natural disasters — boiling lava, tsunamis, etc. — that kill people off or wipe out settlements, so apocalypse is pretty much on-going. However, every few hundred years or so, a really big eruption/quake disaster happens, with ash fall blocking the sunlight and other deadly destruction that can last for years or even a decade, which they call a Fifth Season. So the human communities are sort of feudal with moderately rigid caste systems, but highly independent and ruthless, storing food and water for when a Season comes to their region, according to the stonelore — ancient texts on survival from past civilizations. Above them also float large magical metal obelisks, mysterious artifacts of long ago that sometimes move around. The continent is mainly ruled by an Empire that solidified its hold over other nations during the various past fifth seasons and benefits from more stable areas near the equator, allowing it to have tarred highways and electricity. Part of the empire’s strength lies in its slaves, the orogenes, who magically have the ability to control, disperse and shape seismic forces by drawing from the heat in air, water, under the earth and all living things and sending it into the earth to do their bidding. Orogenes are blamed by the populace for the seismic instability of the world and are usually highly dangerous without training, so when one shows up in the gene pool outside of the capital, villages often kill the person in fear. Otherwise, young orogenes are taken to or bred in the capital city and then sent out on missions to keep things more stable or advance the empire. They are controlled from an early age by the Guardians, those who have the ability to still the powers of the orogenes. A powerful cast of characters starts peeling back the facets and secrets of this world, which include the stone-eaters, a dangerous non-human species that are made of and travel through solid rock, and seem to have particular interest in the orogenes. All events lead towards a massive rent in the earth that may cause a Fifth Season that is going to be beyond anyone’s ability to survive. 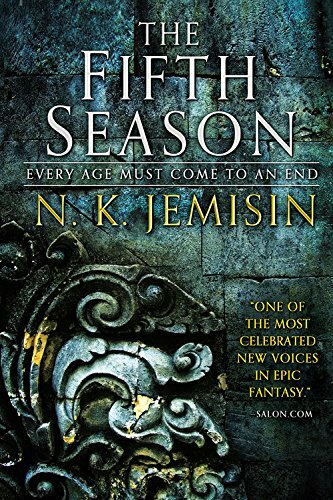 Further along in her career, Jemisin’s writing is even more assured and sneaky. The world she paints is tragic and has obvious connections to our own (she got a lot of the disaster material directly from NASA.) But the story doesn’t wallow and is about the decision points where humans choose who they are going to be in extreme circumstances and what connections between them they are going to allow. 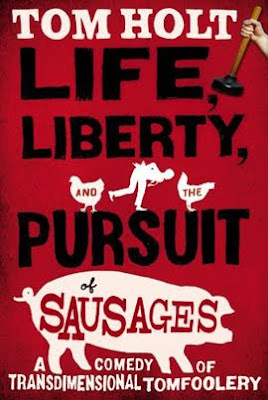 It tackles themes of interest to Jemisin — the nature of identity, the dynamics of oppression, the connection of humans with their habitat, and notions of family and how they change. Plus people who can make or stop earthquakes and eruptions, etc. It’s a rich stew and I really enjoyed this one, though it may not be for you if dealing with serious trauma with superpowers is not your cup of tea. I will be getting to the next work, The Obelisk Gate, fairly soon, I think. Interesting Writings on a…Seriously? More snow? The leaves are changing for fall in Australia already. Yes, I had a lot of them saved up. More reading for you!